You see it out of the corner of your eye; that perfect summer nectarine. You reach for it off the counter. Bring it to your mouth, ready for the delicious bite, at which point 137 fruit-flies surface and shoot up your nose. No good. 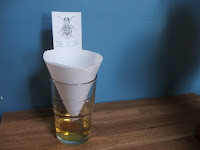 Here is a convenient place to 'store' them --> Glass + wine/piece of fruit/apple cider vinegar + paper cone.... voila! :] i do something similar, except i use a balsamic vinegar in a clear glass with saran wrap tightly over the top, just punch little holes in it and you've got a 100% successful fly trap!